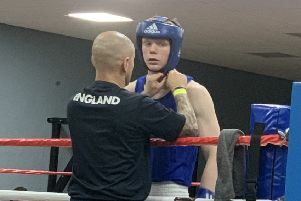 Luton boxer Jordan Reynolds enjoyed an excellent World Series of Boxing debut for the British Lionhearts as they comprehensively defeated Croatian Knights 4-1 in Zagreb on Friday night. The Lutonian managed to stop his opponent Mario Opsivac in the fifth round and tweeted afterwards: “80th fight, 71 wins - World Series debut with a 5th round TKO. A defeat for overseas selection Florin Laurentiu Balteanu, who lost to Nodari Darbaidze in the opening bout in Zagreb, gave the Lionheart’s the encouragement to push on in the contest. That they did as victories for Niall Farrell, Dalton Smith, Radoslav Pantaleev and Reynolds, boxing at middleweight, were enough to secure a resounding triumph. GB Boxing’s performance director, Rob McCracken said: “This was a strong performance from the British Lionhearts. Next-up the British team face France Fighting Roosters in Newport on Saturday to decide who finishes the regular season as winner of the European group. On his plans for the immediate future, Reynolds tweeted: “Back home safe & sound want to thank you all for the good luck & well done messages means a lot.